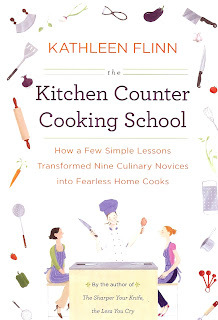 We have enjoyed Kathleen Flinn's first memoir The Sharper you Knife the Less You Cry ( which was an account of her experiences studying at the venerable Le Cordon Bleu) and, as a result, we were thrilled to get hold of a review copy of her follow up work The Kitchen Counter Cooking School (Viking) is a sequel of sorts to "Sharper" Ms. Flinn takes her newly developed Cordon Bleu expertise and attempts to influence and school a group of nine students in some basic, but elegant methods of shopping, preparing and cooking food. 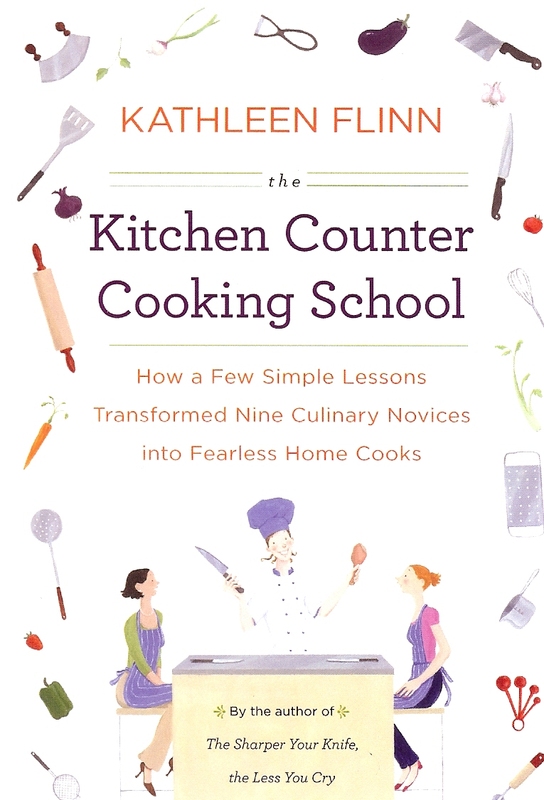 Ms. Flinn's book has somethings in common with such popular television programming as "What Not To Wear" in that there is a sense of transformation that she takes her students through with kitchen makeovers and a recalibration of taste and food choices. One of the key differences here is that Ms. Flinn is a much warmer and re-assuring prescence in this book than some of the brittle hosts of reality programming. One of the central themes in the book is the disconnect between eating and cooking. The celebrity chef culture that has helped make formerly niche networks like Food TV mainstream fare and has made household names out of the likes of Bobby Flay, Anthony Bordain, Giada DeLaurentis, Nigella Lawson and so on. The suspicion raised in Ms. Flinn's book is that Food oriented television is watched as pure entertainment rather than as aspirational televison. Indeed, a key moment in the book is when one of Ms. Flinn's students admits she eats Tuna Helper while watching Gordon Ramsey! Simply put, a major notion in Ms. Flinn's book is if people can't cook or aren't motivated to cook then they are at the mercy of convenience and fast food options. Indeed, considering the broad appeal of Ms. Flinn's notions and taking into consideration her warm YouTube prescence it seems she would be a natural to host a televsions series; (Kathleen Flinn's Kitchen Counter Cooking School? ).